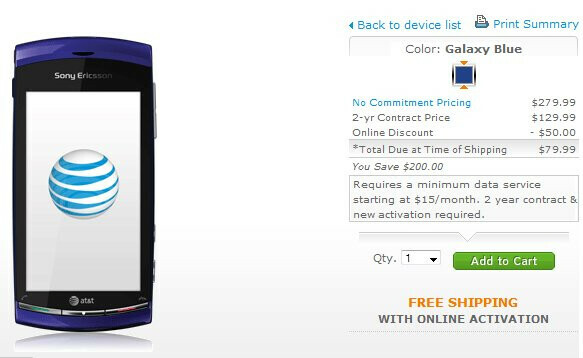 It's rather difficult to overlook AT&T's version of the Sony Ericsson Vivaz even though it's finally landing here stateside after a lengthy time being made available abroad. Although it might not hit the top marks in every category, we're confident that its inexpensive price tag will surely garner some looks – especially more when it's an inexpensive solution for those looking to get into the HD game. Priced fittingly at $79.99 with an accompanying contract, customers won't have to spend a lot if they're looking for something that'll allow them to shoot 720p HD videos. In addition, its 8.1 megapixel auto-focus camera with LED flash will easily make it a perfect point and shoot replacement – even more when its design mimics them. This S60 5th edition smartphone also features a 3.2” resistive touchscreen, Bluetooth, GPS, Wi-Fi, and all of the neat things that come along with the platform. Even though it might be a little late in coming to market over here, its $79.99 on-contract pricing more than justifies a reasonable purchase.